Over the years we've read two of Martin Moran's earlier books about Scotland, "The Munros in Winter" which emerged in a new edition a couple of years ago, and "Scotland's Winter Mountains", which we came across in 1998 and which did much to help feed our own long-standing fascination with Scotland's mountains. 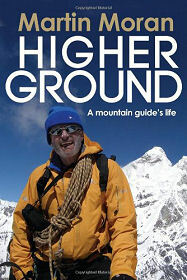 So when the opportunity arose to review "Higher Ground: A Mountain Guide's Life" by Martin Moran, we leapt at the chance. It would be fair to say that we approached the book with high expectations, and equally fair to say that it more than lived up to them. "Higher Ground" is an autobiography of sorts, but a very particular kind of autobiography. Yes, there are parts of the book in which we learn of the author's upbringing and formative years, and of his marriage and family life. But these are here primarily to help establish the framework within which most of the book is set. The subtitle of the book is "A Mountain Guide's Life", and when you turn the page you find it delivers exactly what it says on the cover. The book is divided into six section, from "Formative Years" through "Home Ground: Scotland", "Alpine Adventures", "Norwegian Lights", "Indian Pioneer: The Himalaya" and "Reflections". The bulk of the content, contained within the four geographical sections, comprises a series of recollections of expeditions and adventures, clearly based on detailed diary entries made at the time. These bring the mountains to life in a marvellously vivid way. Some of the author's writing is also extremely amusing. We read, for example, about the Norwegian industrial town of Ovre Ardal: "Fort William on a wet day is an Arcadia by compare." What comes through most compellingly, however, is Martin Moran's simple love for the mountains in which he spends so much of his life. And as we read his account of a search for a lost valley in the Himalaya first discovered by Eric Shipton in the 1930s, something else that had been at the back of our mind began to come to the fore. Parts of "Higher Ground" have the grip and intensity of some of the very best mountain writing of W.H. Murray, published in the years after World War Two. The thought begins to dawn on the reader - this reader anyway - that Martin Moran is in some ways a man out of time, the living embodiment of the magical spirit of exploration and discovery of his predecessors in the mountains of Scotland, the Alps and the Himalaya, in the 1930s and 1940s. This book is a "must read" for anyone who has ever felt drawn to the mountains, whether in Scotland or beyond.